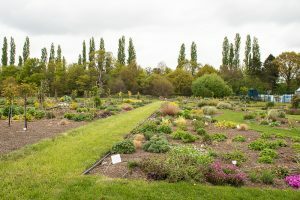 Our Celebration Garden was created to celebrate our 60th year of business in 2015 and it has since been enjoyed by many visitors. 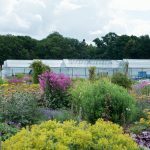 Now in its 4th year it’s really coming into its own and we are delighted to announce that our Celebration Garden is now part of the National Garden Scheme! 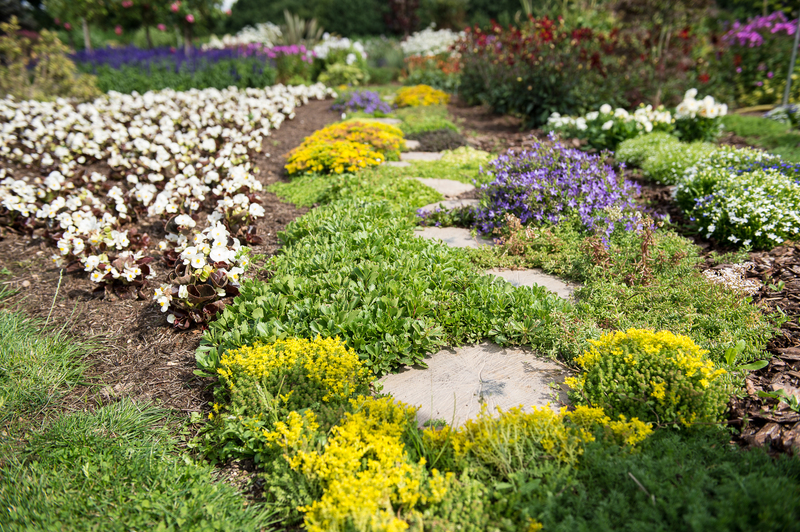 Not only does our Celebration Garden celebrate our time in business but it celebrates the beauty of gardening. 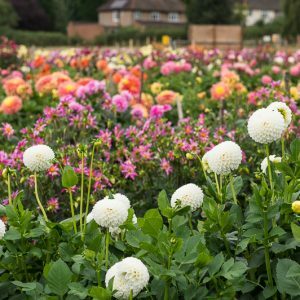 Planting schemes have been carefully considered and cared for and our famous dahlias are planted amongst an array of delightful shrubs and perennials. 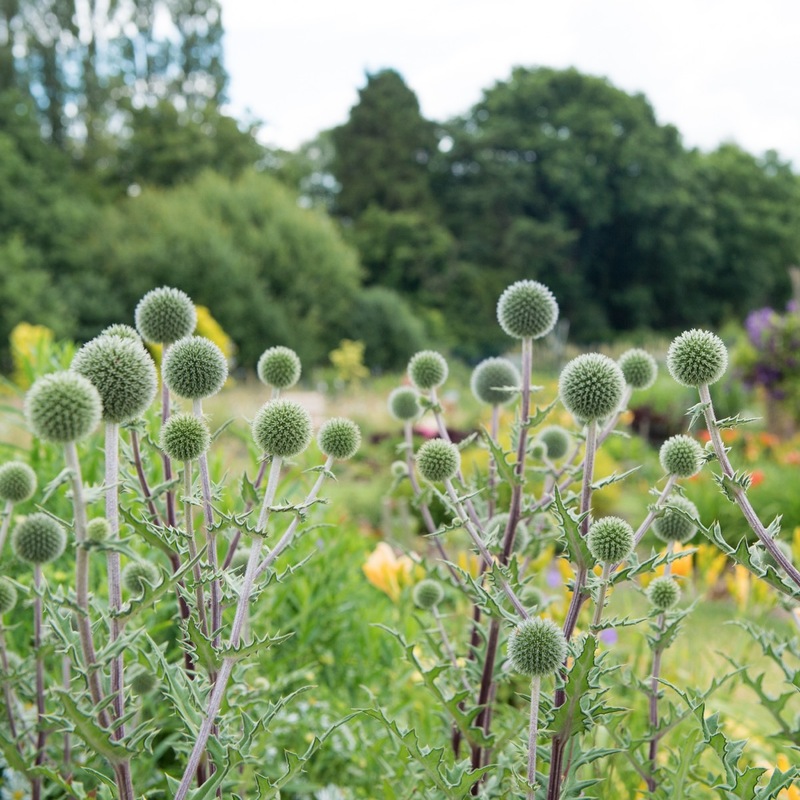 The garden also celebrates patience and hard work, designed by Mrs Aylett and carefully tended to by our gardener, Chris, this labour of love has transformed into a garden to be proud of, that is inspirational and can be enjoyed by visitors of all ages. 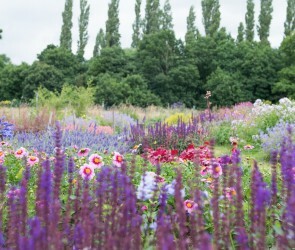 The garden offers a place of tranquilly and beauty away from the hustle and bustle of the busy A414 road which it sits alongside, open all year round it is a joy to watch it change through the seasons but every year you can see it in its full glory when the Dahlias are also in flower during August and September. Our Celebration Garden is located adjacent to the Garden Centre, and can be accessed through the gates at the top end of our car park, during our usual opening hours. 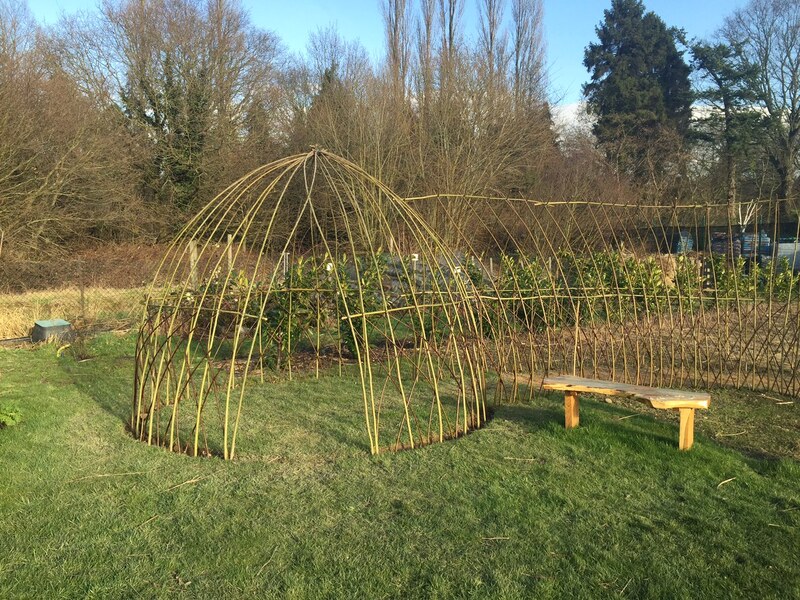 Our team have been very busy in the Celebration Garden. Springtime has started in earnest and after much preparation the garden is awakening from it’s winter slumber. 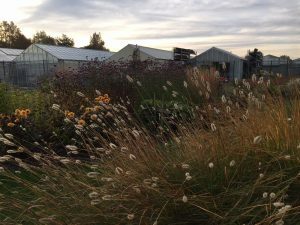 We have been busy weeding, digging, pruning and generally tending to the garden and planning new displays and features. 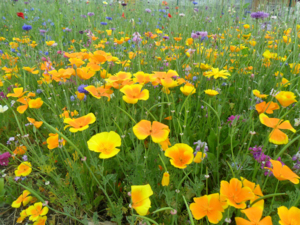 The wildflower beds are being sown in stages with different mixes to give us a longer display through the season. 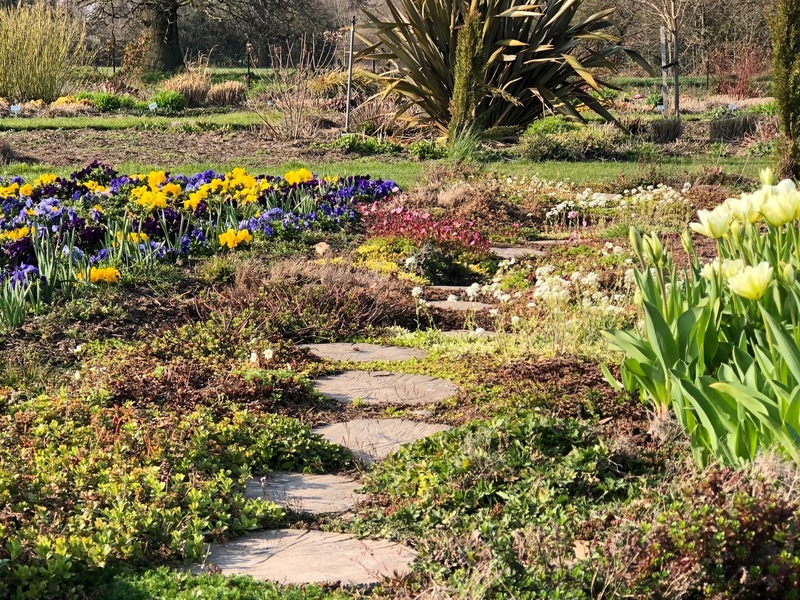 Early flowering plants such as Bergenia, Pulmonaria and Brunnera are blooming and new shrubs and trees are establishing well. 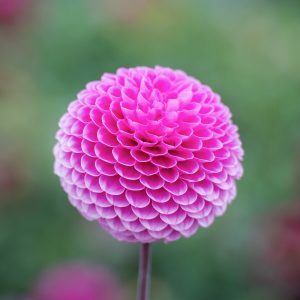 The first batch of Dahlia tubers have also been carefully prepared and planted in the garden by our expert Nursery team. 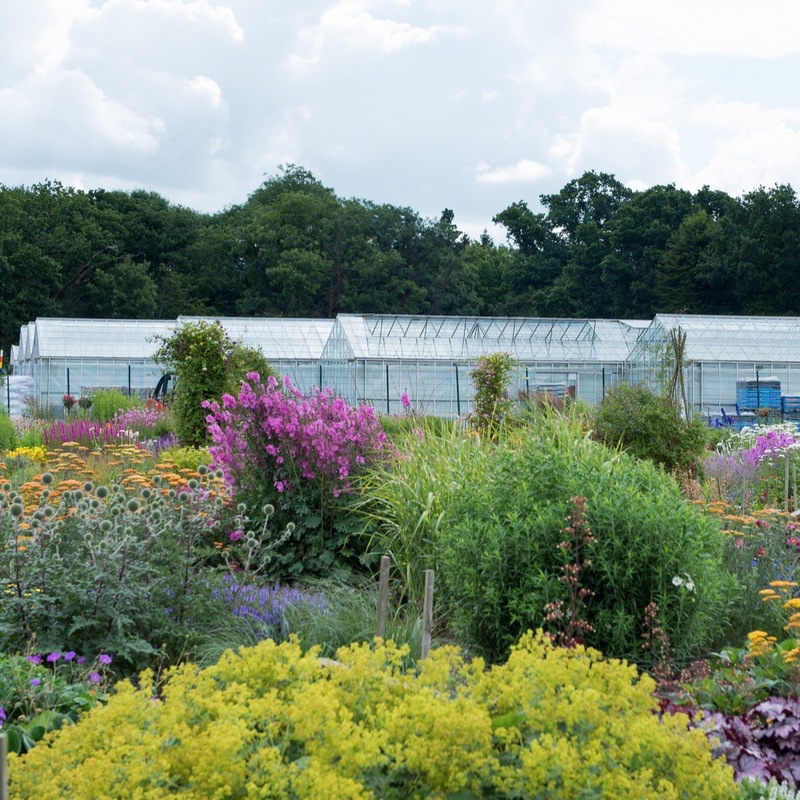 This is an exciting time for us as we plan ahead and watch in anticipation as the garden grows and develops. 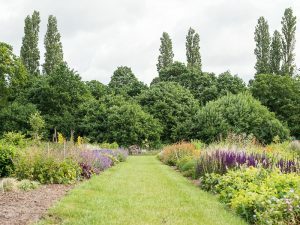 If you are visiting and enjoying a stroll around the garden, do stop and say hello, Chris will be happy to welcome you and talk about the garden’s progress. The Celebration Garden is really taking form and coming to life now that the weather has brought us some sunshine and showers. We are working hard adding new planting such as our blend of Clematis and climbing Roses along our fence line. 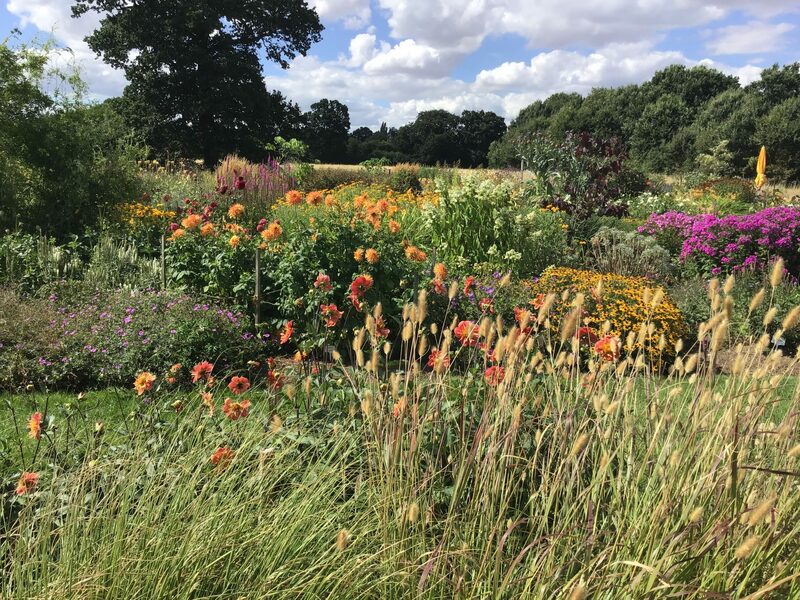 A new long flowering border has also been added at the front of the Dahlia field containing a mixture of red and yellow Geums with Variegated Iris. 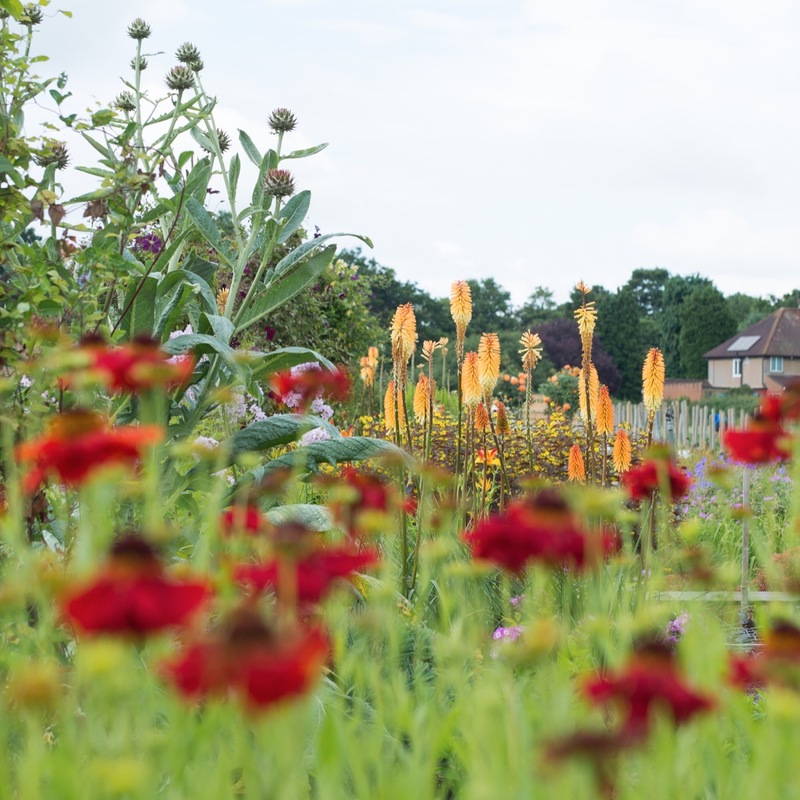 This year we are planting a lovely selection of small trees around the garden and along the central borders. 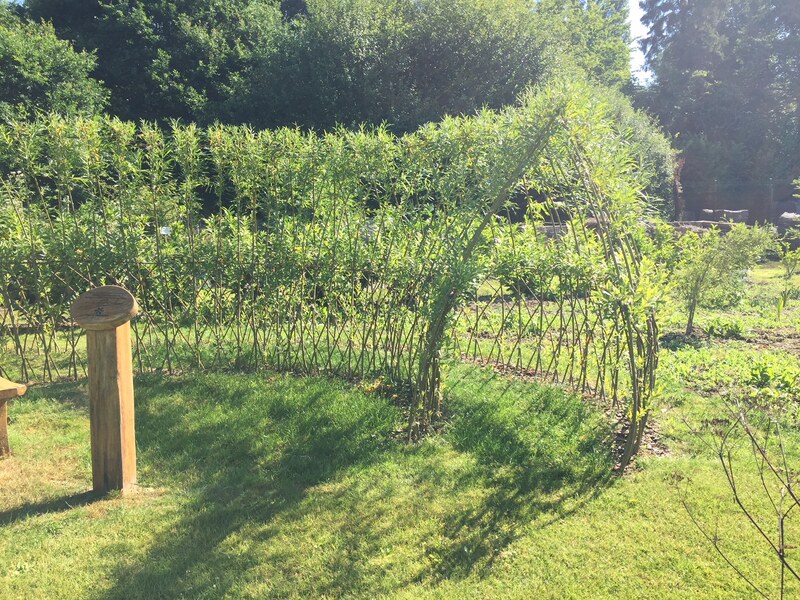 The new trees add height to the garden and will attract a variety of birds and insects. 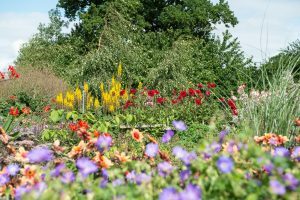 Our first planting of wildflowers are coming through strongly now and the second wave has now been sown for our Summer display. 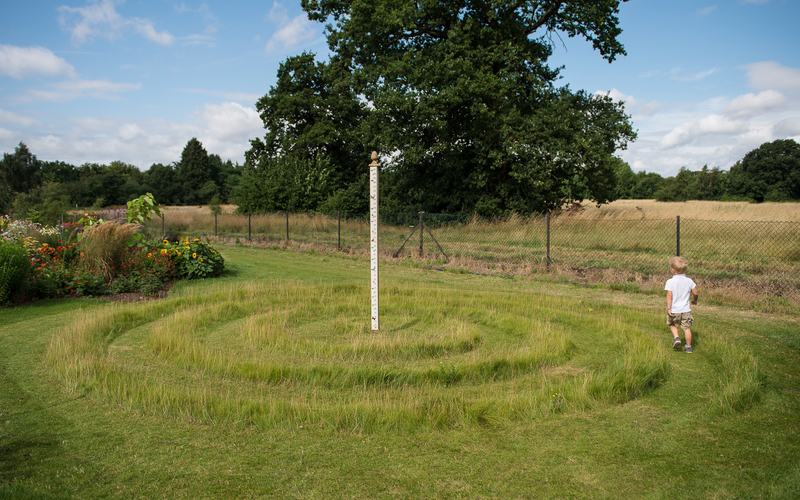 We are planning some more surprises and features for the Celebration garden over the next few weeks such as our new spiral lawn maze so watch this space. How the garden has grown over that last month. 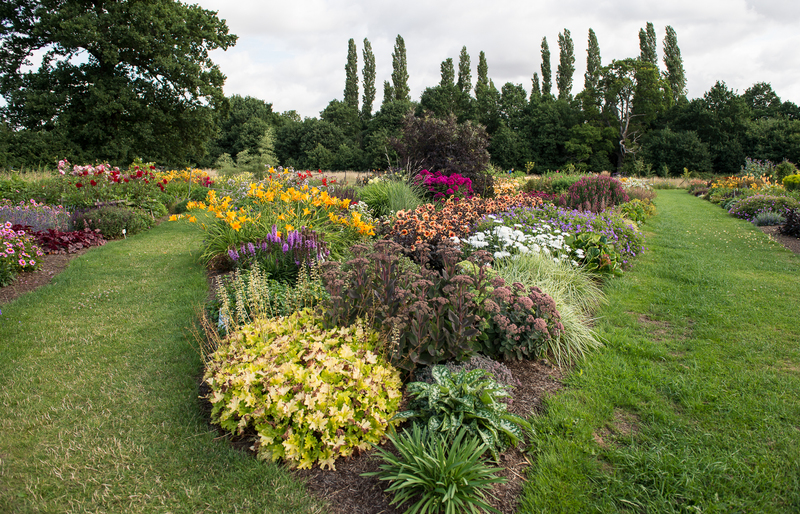 The roses are in flower, and the early summer perennial plants are also in full colour. 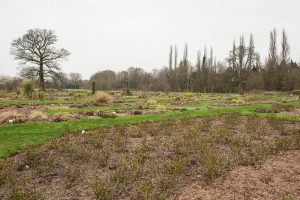 The Dahlia Field was planted last week, the strong winds over the weekend will have given the plants a bit of a shock, and now there is about ten days before anything appears to happen – but beneath the soil there is a mass of activity with the young roots getting themselves established. 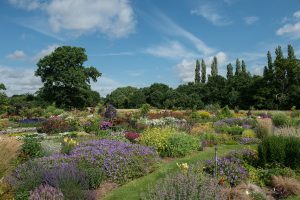 The field and garden are open to walk around at your leisure and watch their progress over the summer months. 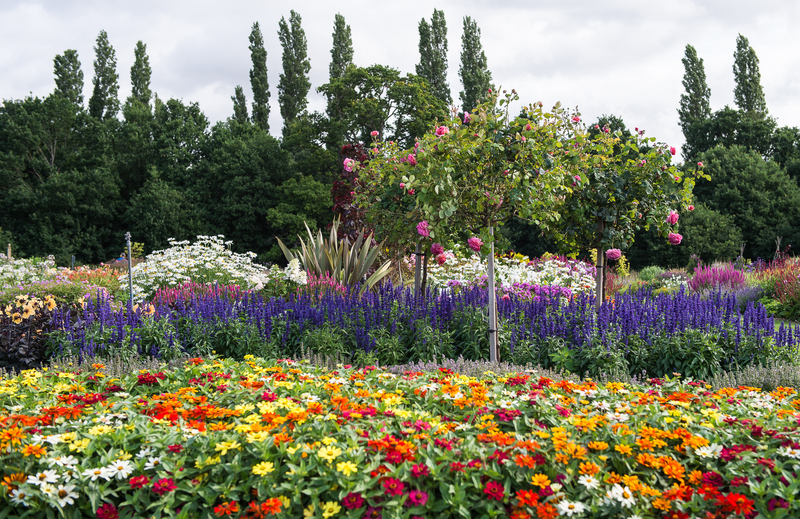 This month’s mix of sunshine and much needed rain has given the Celebration Garden a boost, and our plants are providing a lovely mix of colours for our Customers to enjoy. 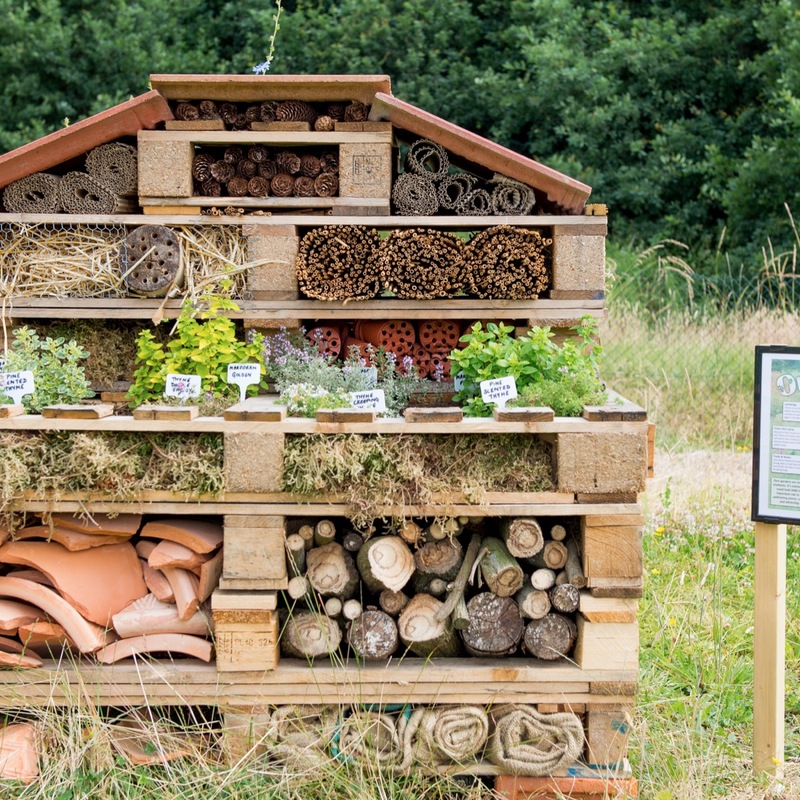 We are taking part in ‘The Big Butterfly Count’, and many Children and Adults have been busy chasing butterflies around the garden, and filling in their charts. 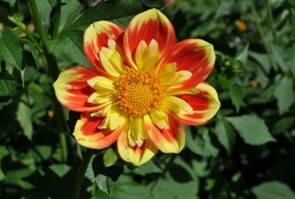 Many of the Dahlias in the flowerbeds are in bloom, and the Flower Carpet roses are a mass of bright pink. 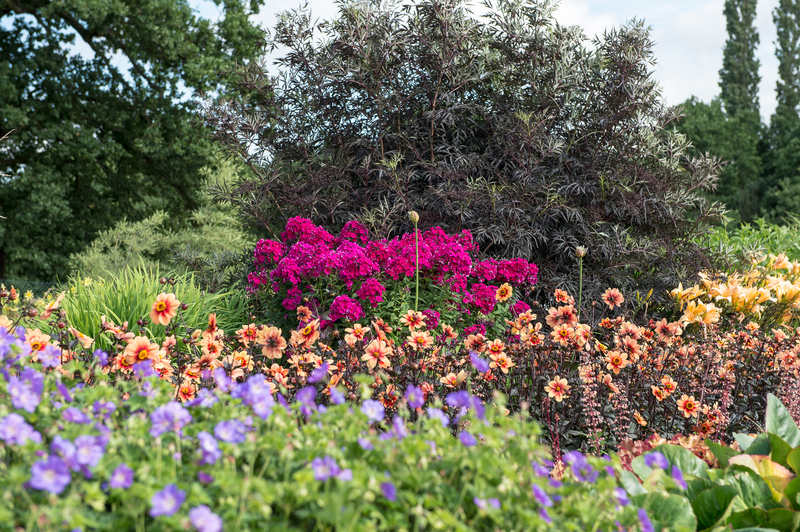 When you come to visit, also look out for our Clematis plants, which are flowering beautifully right now. 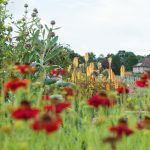 Some of the other plants that are looking lovely at the moment are Ligularia, Persicaria, Leucanthemum, Kniphofia, Monarda and Echinacea. The Garden is constantly changing at this time of year. 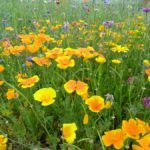 The wild flowers are too, the blue sea a couple of weeks ago has now been joined by bright yellows and the pink of the Cosmos are just beginning to open. 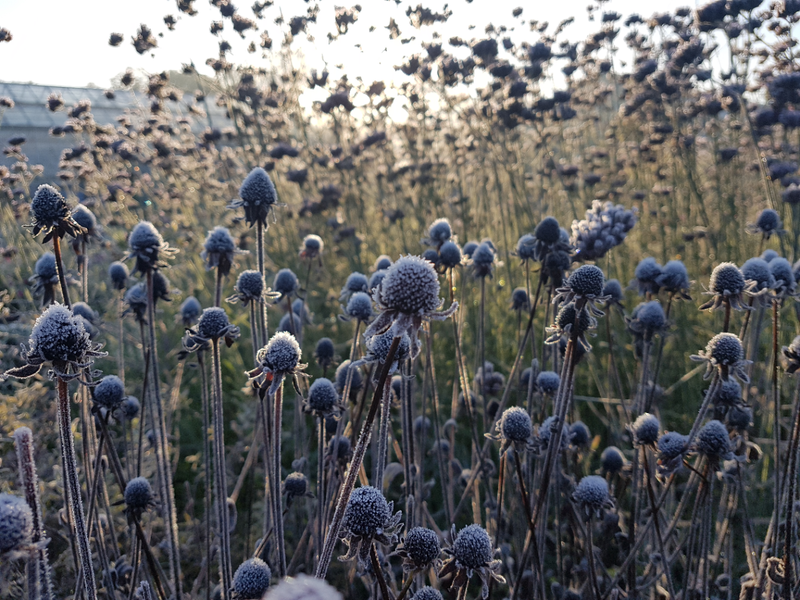 If you stand still and watch you will see that the border is a mass of humming pollinating insects and bees. 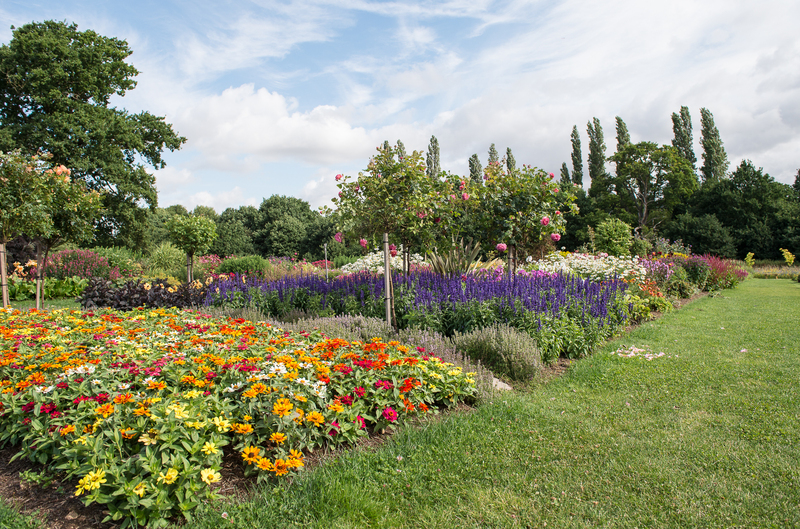 We hope you enjoy visiting our Garden, where you can escape for a little while, and enjoy the relaxing atmosphere. 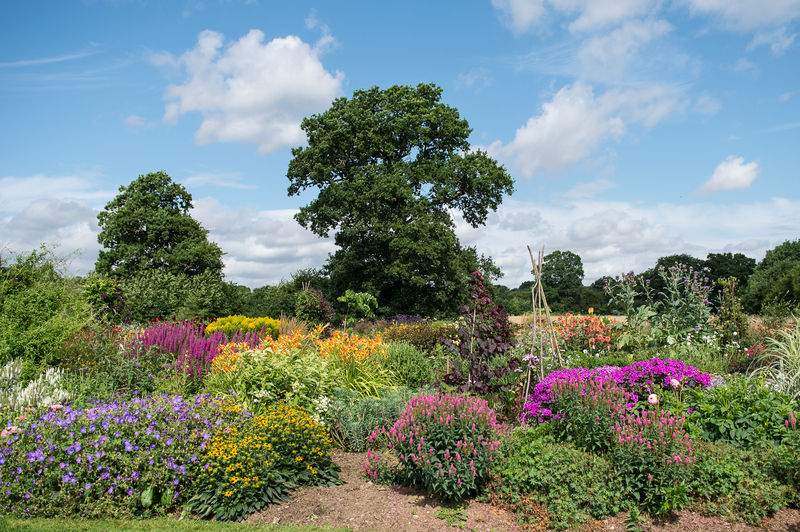 The Celebration Garden has quickly become a blaze of colour and the Dahlias are really putting on a show. 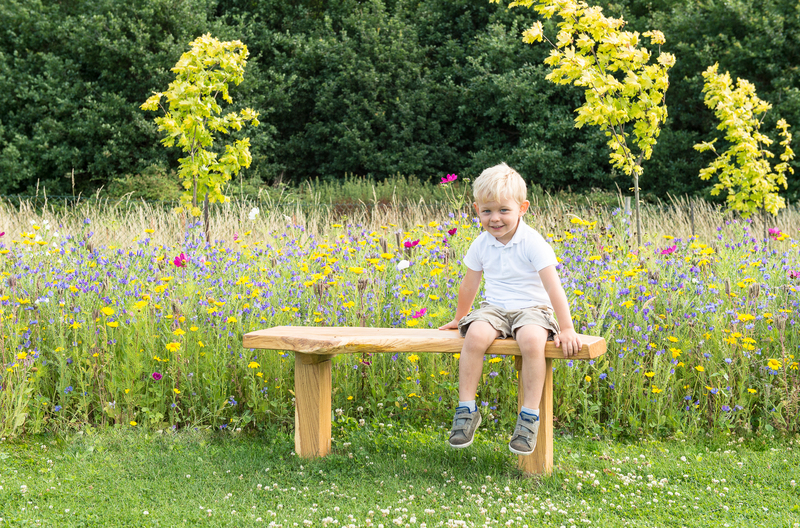 Our wildflower meadow is a haven for wildlife, occupied by beautiful butterflies and busy bees amongst other pollinating insects. 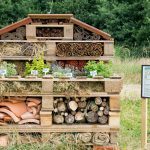 Families visiting the garden are spending time bug hunting in our ‘Bug Hotel’, getting dizzy in our spiral maze or seeing how they measure up against our measuring pole. 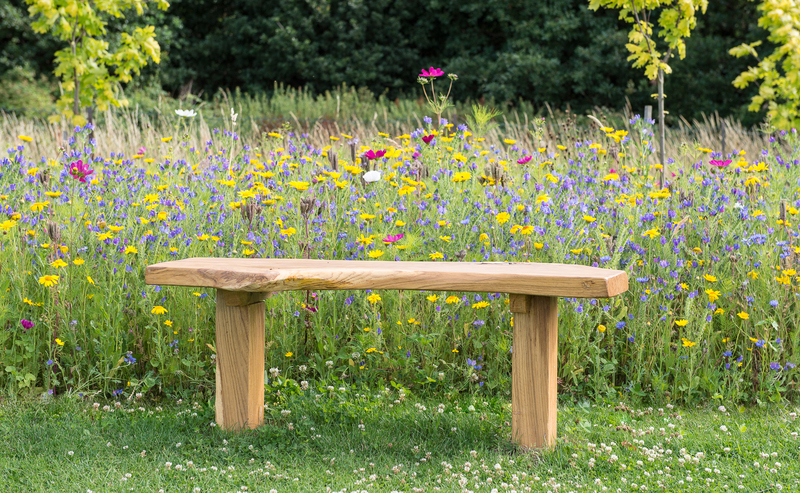 The addition of our reclaimed oak benches have become a welcome place to take a rest, sit and be inspired, or simply relax among the beautiful surroundings. Autumn is here! and with the season change, a delightful range of colours in shades of russet, red, gold, yellow and orange and have arrive in the garden. 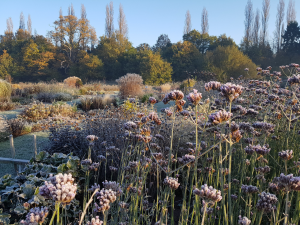 November 2017 – Still looking good! 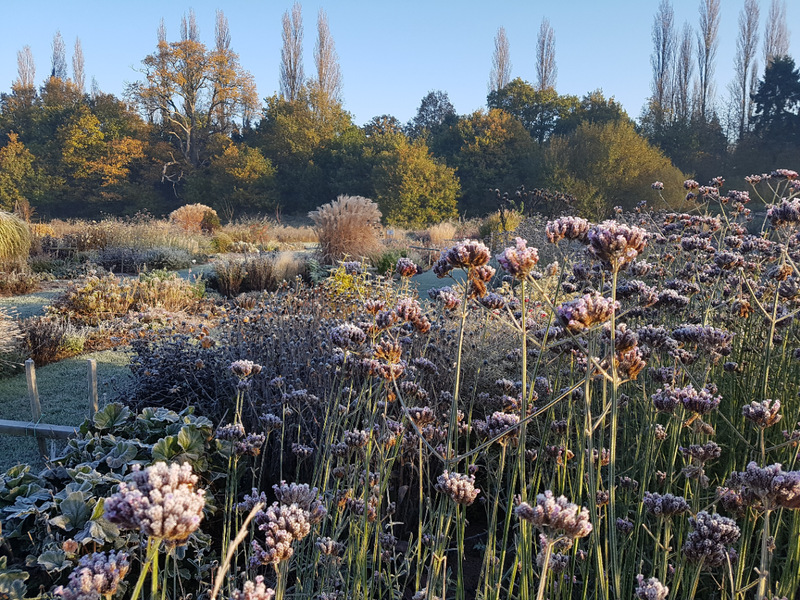 So here we are approaching the turning of Autumn to Winter and the Celebration garden is still looking lovely. 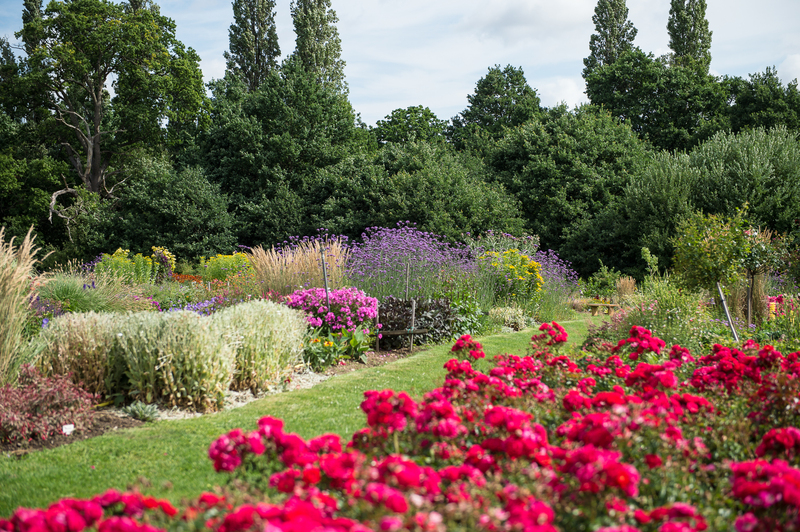 Our beds of Flower Carpet roses in red and pink are having a second go at flowering this year and we have many varieties of Fuchsias and Penstemons now looking the best they have all year. In particular Fuchsia ‘Tom West’ looks stunning with it’s attractive foliage. 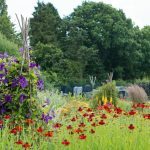 Our wildflower bed continues to impress both the visitors and the bees, along with the Salvia ‘Hot lips which has been flowering all Summer and Autumn.